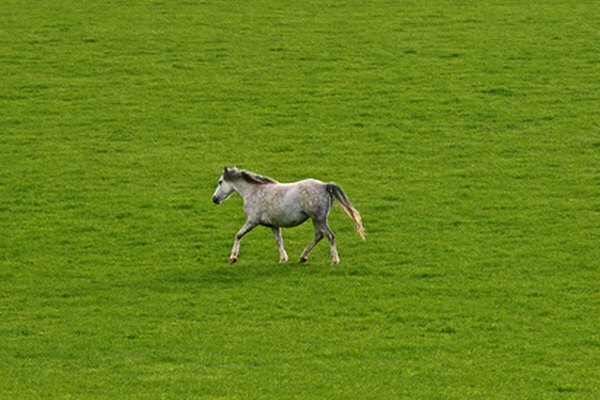 Most horses move forward in four basic gaits: the walk, trot, canter and gallop. Riders more familiar with the Western style of riding--the kind movie cowboys do--may refer to the trot as the jog and the canter as the lope. But, no matter what they're called, it is easy to tell the difference between horse gaits if you know the basic mechanics. Listen for the sound of the horse's hoofbeats if he is walking on hard ground. At the walk, the horse will be moving at his slowest gait. You should hear a distinctive four-beat rhythm and be able to count “one-two-three-four” as he moves. If he’s not held tightly by a rope or bridle, his head should move in a slight nod as he walks. Watch the horse's legs. If a front leg and a back leg on the other side are moving together, he's trotting or jogging. A horse that’s trotting will move faster than a walk, at a rhythmic, swinging pace. His hooves will tattoo the ground in a distinctive two-beat clip-clop, as his legs move together in diagonal pairs. As one foreleg reaches out, the hind leg on the opposite side will reach forward. He may hover slightly in the air before those hooves touch the ground and the other two legs swing forward. At the jog, the legs move in the same pattern but at a slower pace than the trot, often just slightly faster than the walk. Focus on the sound of hoofbeats and the pattern you can see, as the horse moves more quickly. If she's cantering, she'll seem to bound forward. 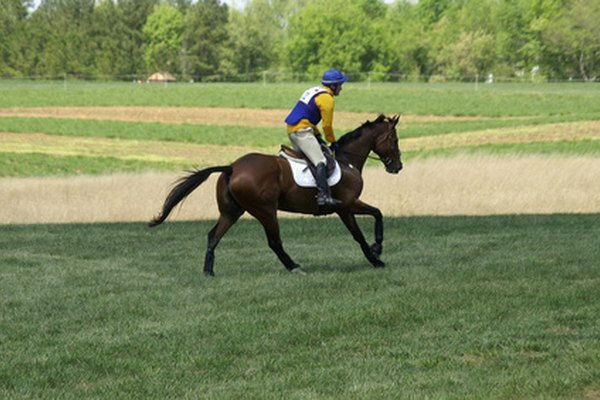 Usually faster than the trot, the canter is a three-beat gait with a slight pause that occurs when all four hooves are off the ground for an instant. When a horse canters, one foreleg will “lead,” which means it lands on its own and slightly ahead of the other front leg. For instance, if a horse is leading with her right front leg, her hooves will hit the ground in this order: left hind; right hind and left front at the same time; right front; then a moment when all four hooves are off the ground. A horse that’s loping in proper form should follow the same sequence of hoofbeats, but at a less-animated, less-rollicking pace. Look carefully to tell the difference between the canter and the gallop, the horse’s fastest pace. It's unlikely you'll be able to distinguish it by hearing the footfalls. There also are better clues than watching the sequence of leg movements, which is similar to those in the canter. A gallop is a four-beat gait, with the legs that landed together in the canter hitting the ground separately. 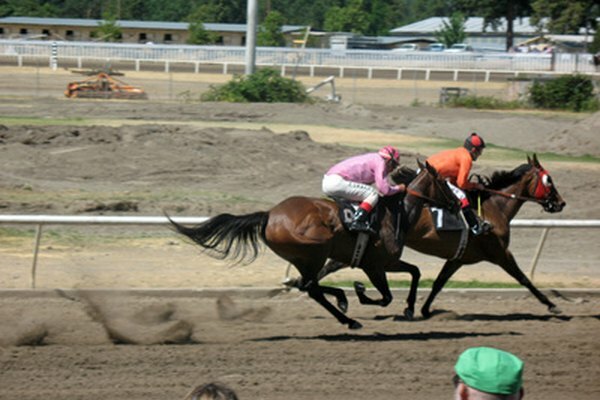 During the gallop, though, the horse spends more time completely off the ground. In a picture, he may seem to be hovering. His stride is longer, and he may appear to become flatter across the top of his body and more elongated. In judging the slower gaits, you'll have the most success if you ask the horse's handler to move him past you in a straight line over a paved area, so you can clearly hear his footfalls. Another advantageous spot for observation is in the center of a small circular corral, called a round pen. Ask the handler to move the horse forward freely in a circle around you, giving you plenty of time to observe each gait. 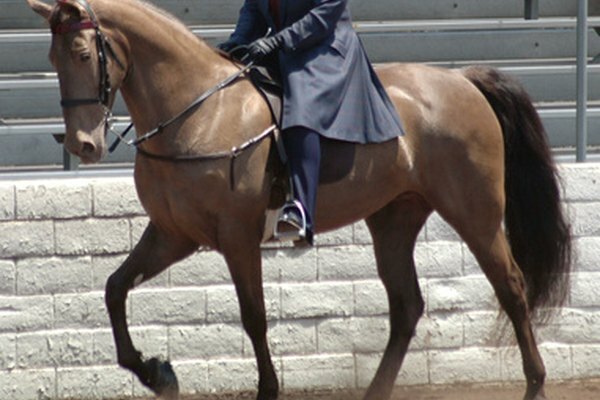 If you're watching a horse that's carrying a rider using an English saddle, chances are the rider will move in a rhythmic up-and-down motion when the horse is trotting. At the canter, most riders sit deeply in the saddle. At the gallop, most riders lift up out of the saddle slightly, tilting forward a bit. If you stand directly behind a horse, she can't see you, because of the placement of her eyes on her skull--and that puts you in danger. Horses are animals of flight, not fight. If startled, they often kick out and run. To be safe, always stand where you won't surprise the horse, or be in the way if something else surprises her and makes her bolt in fear. Some horse breeds are called "gaited" breeds. That means they move forward in one or more gaits that are significantly different--and often far smoother to the rider--than the four basic gaits. In some breeds, these special gaits come naturally. In others, the horses must be trained to perform them. These breed-specific gaits are: the pace, slow pace, fast pace, sobreandando, tolt, running walk, fox trot, paso fino, paso corto, paso largo, paso llano, rack and slow gait. Some Western riders will slow the horse's jog and lope so much that the horse no longer follows the natural sequence of leg movements. Since 1992, Nanette Woitas Holt has worked in some of the countries top newsrooms. She also has been a staff writer and editor for the international magazine Woman's World, has traveled on assignment for Reader's Digest, has managed successful political and public relations campaigns and has edited a book that's sold 40,000 copies. She holds a degree in mass communications.